Collaboration between Denel Aerostructures, the Council for Scientific and Industrial Research (CSIR) and the University of Pretoria (UP) aims to establish a specialised local capability to analyse the loads of aerospace fuel tank structures – a crucial safety consideration. The project is supported by the Aerospace Industry Support Initiative (AISI). According to Marié Botha, AISI Manager, “The AISI strives to position the local aerospace and defence-related industry as a global leader in niche areas. A crucial part of realising this vision is to ensure effective interdepartmental participation and collaboration. Overall, our work with Denel Aerostructures is but one example of giving wings to our objectives. The AISI is an initiative of the Department of Trade and Industry (the dti) and is hosted and managed by the CSIR. The movement of a liquid inside another moving object, known as sloshing, is an important aspect of aerospace fuel tank design. Sloshing in large fuel tanks causes impact loading on structures and can threaten the dynamic stability of the vehicle in which they are contained – typically airliners and space launch rockets. A specialised capability for the analysis of sloshing in aerospace fuel tank structures will provide critical design information to the local industry. Researchers anticipate that leveraging locally developed technology will effect a competitive advantage in the international market and will attract foreign investment. Subsequent incorporation of advanced manufacturing will enable the sustained growth of human resources and skills development in the country. While the AISI acts as facilitator and funder of the project, Denel Aerostructures is responsible for the design and manufacture of two test tanks that will be used to validate the flow simulation software developed by the CSIR. The UP is the partner responsible for experimentation. “Denel Aerostructures has achieved its targets by delivering the two tanks to the CSIR. We are discussing future opportunities at the moment,” says Visser. Proven partner expertise Denel Aerostructures has extensive background in the design and manufacturing of complex metallic and composite aero-structures for the military and commercial aviation sectors. It is a risk-sharing partner in the international A400M Airbus programme and it has an established track record in the design and manufacturing of integral fuel tanks, notably for the Impala, Bosbok and Kudu aircraft, as well as external fuel tanks, for example ferry tanks for the Rooivalk combat helicopter. The CSIR has developed software to model dynamic fuel movement and subsequently predict loading on tank walls and baffles (used to restrain the flow of a fluid). This high-fidelity simulation approach provides design engineers with greater insight into the operating conditions of tanks during the design process and allows them to improve safety of the system and increase its efficiency. Tests to validate the numerical algorithms used in the analysis of fuel sloshing in tanks are critical to establish confidence in the simulation software – and adoption by industry. Virtually no usable validation data are available in literature, and experimental analysis therefore represents significant value addition. Here the UP’s Centre for Asset Integrity Management comes in. Its background in dynamic response reconstruction with a large range of servo-hydraulic actuators and the capacity to do accelerated multi-actuator tests on multi-ton structures, places it in the ideal position internationally to integrate research with industrial-scale experimental facilities. “This recipe,” Botha recognises, “offers the South African aerospace industry a very unique business opportunity to provide an all-inclusive and competitive solution for the design and manufacturing of fuel tank structures”. “Our objectives for this project have also been met. Denel Aerostructures has established a promising collaboration with research establishments such as the CSIR and the UP, and we have assisted the CSIR with the validation of a valuable tool to calculate design loads on aircraft fuel tanks,” Visser states. The second part of the project studies the application of the technology to a system under design. Denel is developing a rotatory wing unmanned aerial vehicle (UAV) that would carry approximately 180 litres of fuel. It is estimated that the weight of the airframe would be only 20% of the fuel weight and for this reason, the structure would be highly sensitive to the dynamic behaviour of the fuel. 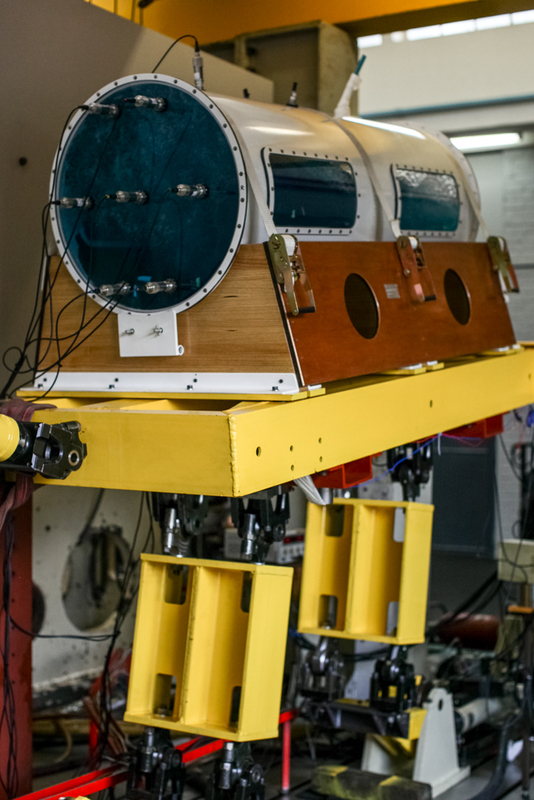 The design, analysis and testing of the fuel tank structure of a rotary wing UAV allow for the integration of numerical simulation and experimental evaluation of the tank to support the design and manufacturing process. Providing design engineers with better insight into system dynamics, this technology would reduce risk during the development stage and improve the efficiency of the system.